Raisins are the delicious and widely popular variety of dry fruits. They are obtained by drying grapes either in the sun or in dryers such that they turn golden, green or black in color. They are produced in many regions of the world and may be eaten raw. They are made from dehydrated grapes. Here on this page, we will see various health benefits of raisins. There are major changes in life after you gets pregnant, and one of them is in the foods we eat. Expecting mothers have to take care their body and have to make proper diet plan. A pregnant woman should eat dry fruits and nuts during pregnancy such as almonds, raisins, apricots, cashews in a limited quantity as they contain important nutrients which benefits both mother and to the baby. Let’s see how raisins benefits in pregnancy and how much to eat them. Raisins are versatile dry fruit. Many pregnant women also suffer from bleeding gums and strong smell in the mouth. They contain oleanolic acid, which protects the teeth from cavity and decay. It also prevents mouth odor causing bacterium and other mouth problems. They also help with Constipation. This dried fruit absorbs water and creates a laxative tendency that makes bowel movements easy. Iron deficiency leading to Anemia is a common problem to women in pregnancy. Raisins contain Vitamin B complex, iron and several such minerals that increase the hemoglobin levels in the body. The fibrous content of raisins helps clean the gastrointestinal tract and flushes out the waste materials and toxic substances from the body. This process also increases the need for food in the pregnant woman’s body which is essential for the growth of the child and both of their overall health. These dried grapes are highly beneficial in healing brain injuries in infants and they are also useful in protecting the central nervous system. Protection of central nervous system enables healthy brain development in babies. Apart from these, raisin or grapes are also useful for enhancing memory. You need to wash raisins every time, before giving it your baby. One of the major reasons is that the first stage of drying grapes could have dips in chemicals. There is a chance that they might still contain traces of those chemicals. So, rinse them thoroughly before processing it. 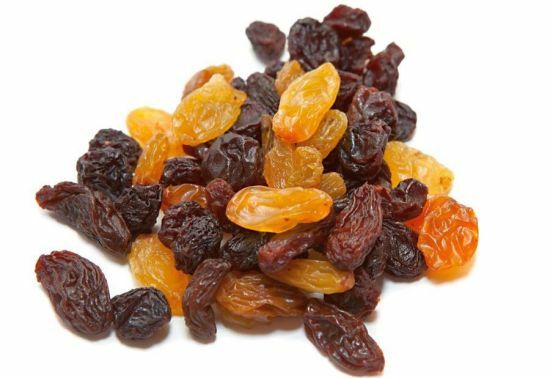 Rinsing also removes any foreign objects that are stuck to raisins due to the sticky outer surface. Raisin pack more nutrition than their small size might indicate. Raisin, like dried apricots, figs, and prunes, they indeed are rich and concentrated sources of energy, vitamins, electrolytes, minerals, and anti-oxidants. Additionally, they contain potassium and magnesium at good levels. This reduces acidity and helps to remove the toxins from the system, preventing diseases like arthritis, gout, kidney stones and they are beneficial not only for gastrointestinal problems but also for constipation. They are rich in carbs, especially natural sugars, they give you a quick boost of energy when you’re feeling sluggish, without weighing you down. The copper present in raisin also helps in the production of red blood cells and B-Complex vitamins in them which help to treat anemia. They are also a good source of dietary fiber, which is beneficial when you’re constipated. Having a few raisins every day is good for your stomach. Raisins contain fibers that start to swell in the presence of water a source of concentrated nutrients. Raisin prevents the growth of bacteria in the mouth to keep the teeth in good shape. As they contain calcium in good quantities, they also prevent the teeth from peeling away or breakage. These help in keeping the skin healthy and beautiful. A daily dose of raisins may also reduce your chronic disease risks. Raisins are a rich source of calcium, which is necessary to strengthen bones and teeth. Raisin is rich in iron and copper, which are necessary for the formation of red blood cells. They also help to correct iron deficiency anemia and promote blood clotting during wound healing. Raisins are an inexpensive, easy and portable food that can help you meet that requirement. Raisins are dried grapes and both provide you with the same nutrients, but the nutrients in raisins are more concentrated. They can be eaten raw or used for cooking, baking, and brewing. They are widely used in cultural cooking in desserts, cookies, pies, puddings as well as savory dishes.